Yes, you read that title correctly. High West Distillery has released a 14 Year Old Light Whiskey that was sourced from MGP Ingredients out of Lawrenceburg, Indiana. What is light whiskey you say? Light whiskey is defined as being produced in the United States at more than 160 proof, on or after January 26, 1968 and stored in used or uncharred new oak containers. This is not to be confused with Straight Whiskey or Neutral Grain Spirits - each of which have much different proof requirements. In the UK light whiskey is referred to as grain whiskey and is used primary as a component of blended whiskeys. The story goes that High West somehow found 100 barrels of 100% corn whiskey that was distilled between 1999 and 2001. The whiskey was aged in second-fill oak barrels for at least 14 years. 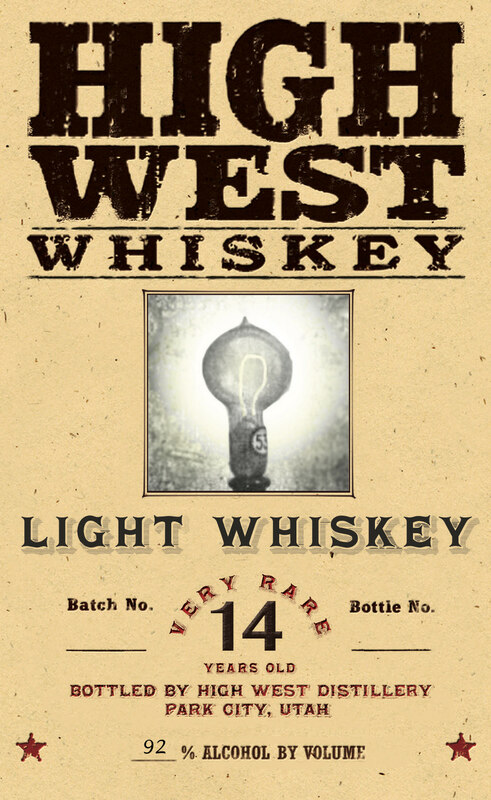 For the full story check out the recent 14 Year Light Whiskey press release from High West. Marketing aside nobody else is selling this style of whiskey by itself in the US. It is used primarily in blends that most self respecting whiskey drinkers wouldn't touch with a 10 foot pole. So what the heck is High West doing with this stuff and why are they selling it as gift shop only for $100 a bottle? Lets find out. Cost: Sample provided by High West Distillery. Gift shop price is $99.95. Pour: 2 oz neat in a Scottish Glencairn glass. Color: Ridiculously Light. As in non chill filtered, no C150 10 year old Islay scotch whisky light. Nose: Starts with Hershey's milk chocolate and Welches concord grape juice. Then a solid gust of orange blossom honey and blood orange zest crawls out of the glass. Light, floral, candy, citrus. Reminds me of riding a bike in spring when the jasmine is blooming. Palate: Velvety viscosity. Big citrus go boom - Navel oranges, tangerines, clementines, indian river ruby red grapefruit, and marmalade. More orange blossom honey, and vanilla. Graham crackers come out of nowhere but are a nice addition. Finish: Medium length. The fade is very warm and creamy. More orange citrus and a dash of white pepper. Wow. Just wow. I was not expecting this citrus mega bomb of a whiskey. Floral, honey, and orange citrus flavors continued to wash over me in waves while I sipped. I have never been in an orange citrus orchard but I can imagine that this is the essence of that experience. Citrus. All of the citrus. Without a doubt this is the most unique American whiskey I have tasted and enjoyed. Now I need to track down a full bottle. Anyone want to mule back a bottle for me from the gift shop? Please? Not going to lie - I went into this review with very little expectations as I had no idea what awaited me. The press release tasting notes where quite interesting - vanilla, white chocolate, and concord grapes. However as interesting as that is my tasting notes rarely line up with press releases so I was skeptical. I can honestly say that this whiskey did not disappoint and is possible the perfect summer whiskey. High West continues to impress me with their sourcing and blending. Cheers David Perkins, Brendan Coyle, and the rest of the High West crew. This rocks.